Arrive into Sydney, a location blessed with a temperate climate. Spend 6 nights exploring Sydney, Australia's favorite city with the world's most beautiful harbor, where travelers will feel like a local by cruising on a well- appointed yacht. Fly onward to Tasmania - the best driving destination in Australia. On arrival into the port city of Hobart, you’ll begin your Tassie adventure. Enjoy a three-hour coastal wilderness eco cruise, exploring the coastline of the Tasman National Park, an island inhabited by thousands of fur seals. Departing Hobart, you’ll meander your way up to Launceston, home to many great restaurants, wineries, and brew pubs. 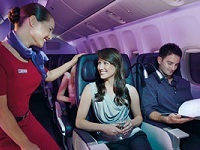 Flights on award winning Virgin Australia to Brisbane or Sydney, on to Cairns, down to Sydney then back home again. Our price includes options in Economy, Premium Economy and Business class – you choose! After breakfast, make your way to the airport where you will depart for Hobart. On arrival, collect your rental car and head to your Hobart accommodations at the Hotel Grand Chancellor, where you will spend three wonderful nights. Today enjoy a three-hour coastal wilderness eco cruise, exploring the coastline of the Tasman National Park between Port Arthur and Eaglehawk Neck in southern Tasmania. Spend today at your leisure. Perhaps if in town on the weekend check out the vibrant market scene in Salamanca Square. Stop at a cafe for a glass of terrific local cool-climate wine. Or head to the Museum of Old and New Art (MONA), an art museum located within the Moorilla winery on the Berriedale peninsula in Hobart. The largest privately funded museum in Australia. The museum presents antiquities, modern and contemporary art from the David Walsh collection. Walsh has described the museum as a "subversive adult Disneyland. After breakfast, drive to Launceston, where you will find your gorgeous accommodations at the Sebel Launceston. Rest and relax in your suite or pop on by Boags Brewery for a pint. After breakfast, drop your rental car off at the Airport. Board your flight and begin your journey home to the US. Half-Day tour - Sydney harbour cruise aboard a luxurious 52 foot Motor Yacht.